Tags: blind hiker, Hiking, Inspiration, outdoors, Quinn, Randy, winter. 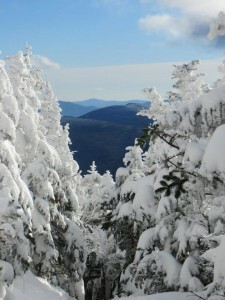 Snowy evergreens stand as sentinels on the slopes. Photo courtesy of Justin Fuller. The “Winter 48” awaits those who become entranced by the majestic beauty of the magnificent peaks shrouded in crispy white snowfall. The sounds are more subdued, though don’t tell that to the chill creaking of the trees or the howl of the winds. The hardwood trees are bare, opening up views of the landscape so vastly different from the summer, isolated yet welcoming. The evergreens are draped so heavily in snow that the silent snow sentinels seem to guard the expansive higher summits even as they shelter any passers through their demesne. Each hiker pursues these travels for their own highly personal reasons. It is thus an incredible wonder to be invited to share a part of that momentous goal with someone. Dina Sutin, filmmaker for “Four More Feet” finished her first Winter 48 on Saturday, January 5, on a trio of peaks: Tom, Field, and Willey. One of the greatest honors in my life is to have the friendship of people like Dina and Justin who went out of their way to make it possible for me to join them for the final trio. It’s ironic—I wanted to lend them my support and celebration of how much I appreciate them, of their support last season in ensuring our own successes, and of their gift of sharing a love and appreciation for these mountains. What I actually received was yet another touching demonstration of their friendship and support, making it likely a better present to me than from me. They showed up at 5:45 a.m. to pick me up and were greeted by a rare but enthusiastic face-washing fest from Quinn! We drove up to the AMC Highland Center on a lightly snowing morning reminiscent of so many moments we had shared the previous winter together. The trails had more hikers than usual, but as is standard of the winter season, our group’s solitude quickly enveloped us as we travelled. Randy took this picture of Dina, Justin, and Quinn at the summit of Mt. Willey. Both Dina and Justin have been piling up the peaks over the past few months and will likely touch the top of all 48 again in this single winter! Though sadly, I know there are likely precious few chances for me to be with them. 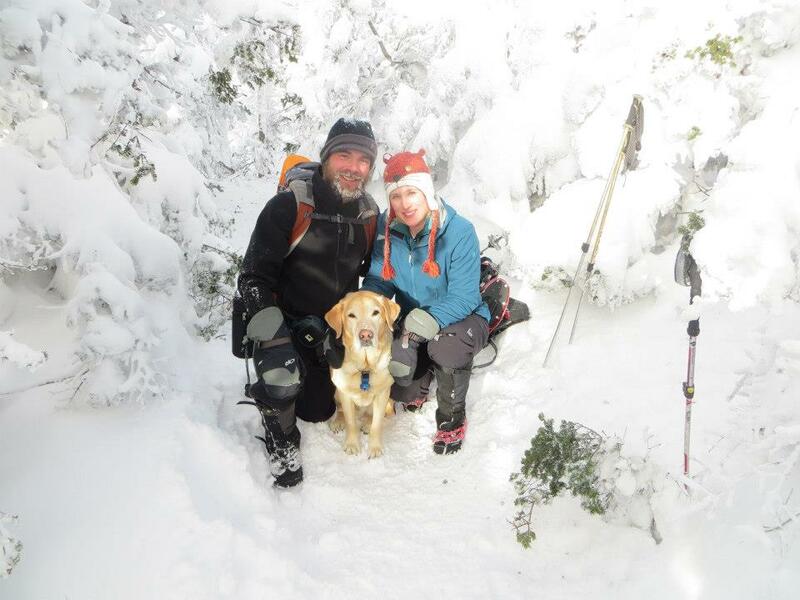 I was well buoyed by Quinn’s incredibly eager return to winter hiking and my chance to be part of this success. But I have a few additional challenges at present which were definitely impacting me and there was some doubt about whether I would be able to be part of the full three peaks needed for completion. In fact, without the incredibly supportive, encouraging, and moving friendships, I likely would not have made it. We pushed through well that day and my proudest moment was to take a picture of Dina, Justin and Quinn at Willey’s wooded summit! So while I’ll never know for certain if my hindrance was higher than my attempts at encouragement and appreciation, this tale on our path is entirely dedicated to friendship and the celebration of your first completion of the Winter 48, Dina. Thank you for allowing me to share the experience with you! I know you’ll downplay the accomplishments all too often but I won’t fail to appreciate their worthiness. I will concede that the better part of the reward isn’t the scorecard of peaks, but the heart full of experiences. Tags: 2020VQ, blind hiker, Bondcliff, Bonds, Cabot, challenges, Eisenhower, Galehead, Hiking, Inspiration, Jackson, Monroe, MtWashington, Osceola, Quinn, Randy, success, Twins, Willey. Randy, Quinn, and friends hike along the path on Mt. Jackson on May 19, 2012. Reflecting upon the incredible highlights of our 2012 hiking season for 2020 Vision Quest, I am overwhelmed with the diversity and intensity of the experiences! This was our third season. It followed a winter of touching the top of all 48 peaks and deepened my understanding of the peaks and the process. So I think a quick tour of the peaks and summation of the entirety of this incredible season is worth a few moments of consideration. It started on Mt. Jackson. The gnarly footing I experienced without the padding of snow winter added considerable challenge the trails. Basking for an hour on a sunny summit with friendship and laughter helped ease the frustration in the difficulty. 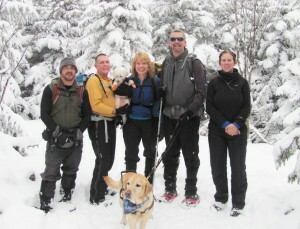 With the challenge came other rewards as well, such as a few new hiking partners the winter had drawn into our company. A view of craggy peaks on Mt. 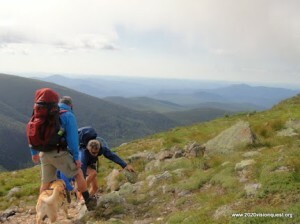 Monroe, over the presidential range hike of July 7-8, 2012. We then took a month away from the mountains while the deerflies ruled and my legs fully healed from the 100-mile walk we did in early June. Our annual July 4 foray was pushed back just a bit and we gave the summer rematch to Mt. Washington. We could not recreate our original crew for this challenge, but we had a more than worthy collection of friends. That trip was an epic success, yielding Washington, Monroe and Eisenhower. It established a level of camaraderie which would set the stage for many of the hikes in the season and all with a different collection of friends. Buoyed by that success, we took on our most challenging water crossings (excluding Owl’s Head) and delivered Twins on our longest day hike of the season. North and South were the objectives, but we added in Galehead for Tracy to ensure that the goal of next season would stage closer. I intend to finish the 48 non-winter in 2013 and it will be done with Tracy beside me, finishing hers at exactly the same moment. 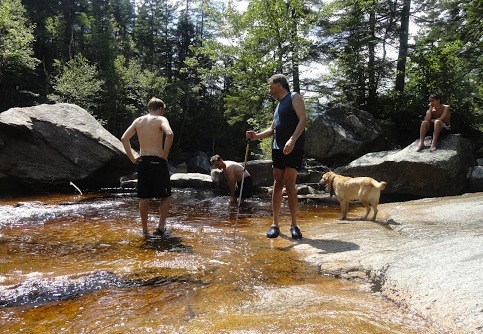 Drew leads Randy through one of the teams toughest water crossings on the Twins hike, July 21, 2012. Just as our group of hikers always come together and enrich the experience by the interactions on a trail, so too will the larger goal be magnified by my sharing so much of it with Tracy including the start and finish of the peak-bagging aspect. Perhaps the most magical of the trips was our Bonds Traverse. 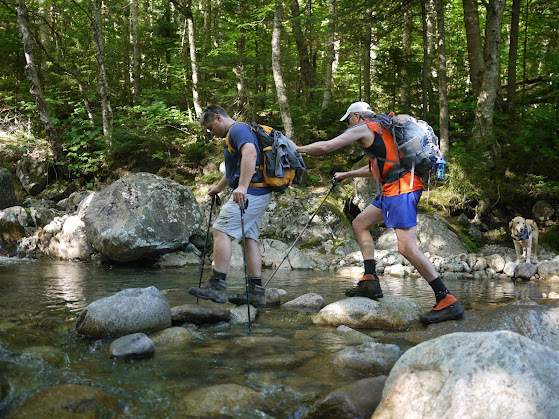 We spent a two-night camping expedition with great friendships and the peaks of Zealand, West Bond, Bond, and Bondcliff all on a 20-plus mile journey through the deepest of the NH wilderness regions. The back-to-back sunset and sunrise atop different 4,000-foot peaks will remain a treasured part of the experience and favorite tale in the retellings ahead. The addition of Thoreau Falls and the foggy cliffs of Bondcliff interspersed the adventure with a little magic and mystery as well. Swimming at the Thoreau Falls on the Bonds Traverse, over Aug. 4-5, 2012. Next we hiked the Osceolas, thereby erasing the last of the peaks which had been climbed by me personally but not within the scope of our 2020 Vision Quest. It was our first ever and the experience had been grueling. This time it was exhilarating. We also included the vaunted Chimney in the conquest. We convened and participated in “trailhead tailgating” which promises to be a long-standing tradition. Finally Willey gave us a Boston globe article and highlighted the premier of our winter documentary at the Highland Center. It also reunited us with our winter team and the slightly overrated challenge of the Willey Ladders. 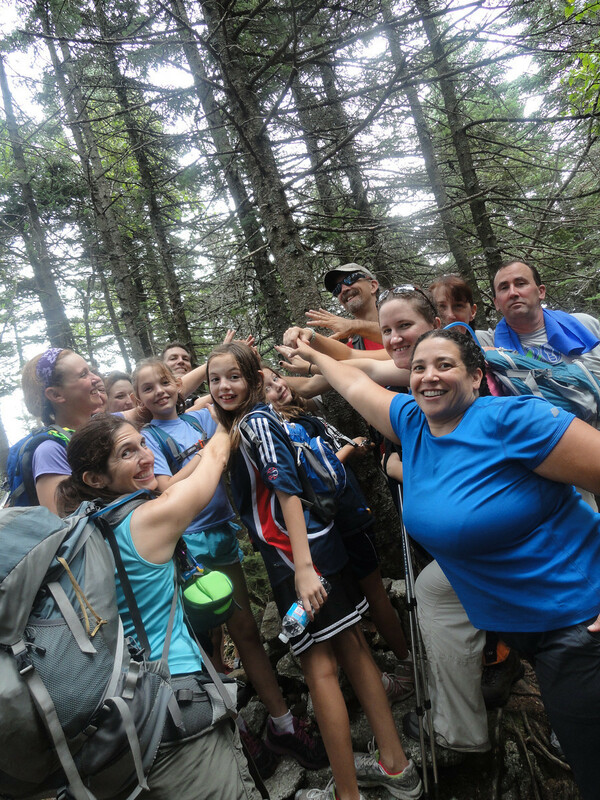 Our 36th peak of the quest was Cabot for the Flags in the 48 program. It was our 14th non-winter summit in a season during which we had sought to match the previous year’s 17 accomplishments. 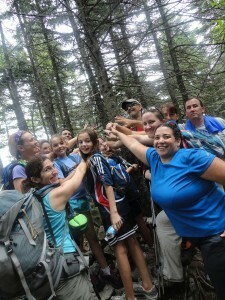 Success at the end of the Osceola hike on Aug. 25, 2012. On our final hike of the season, the Tripyramids, we chose to turn back as a sunny forecast turned into a rainy morning and ensured the North slide would be more treacherous than we needed to undertake. We’d adjusted a few hikes along the way, moved a few, cancelled a few and added yet others. The flexibility and choices to be healthy and happy along the journey are an essential part of the lessons learned throughout the quest. The peaks will remain for another day if the reasons for not hiking are sufficient to lure us away. I am more proud of the decisions not to summit, particularly the final hike of the season, because it makes clear that the quest isn’t driving us but rather we drive the quest. 12 peaks remain for next season to bring us our official 48 for the Quest. This will likely involve 8 separate hikes we’ll announce at our Peak Potential Charity Dinner and Auction on November 17. While the summit is in sight, I think it’s worthy to reflect on what was accomplished this season and what it means to me personally. We completed a single season winter summit of all 48 and produced an incredible documentary on the experience. We added another fourteen summits towards our goal on the 48. Randy presenting a check for $10,000! 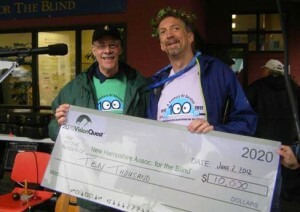 We accomplished an incredible 100-mile walk in tribute to the 100-year anniversary of the New Hampshire Association for the Blind. We brought our total of students reached by our presentations to more than 16,000! We provided a pair of checks for $10,000 each to the two organizations we are pledged to support! Our staff welcomed some tremendously beneficial new volunteers even as we sadly bid farewell to a few who needed to tend other parts of their lives. Thanks to all who have played a part in this Season of Success! 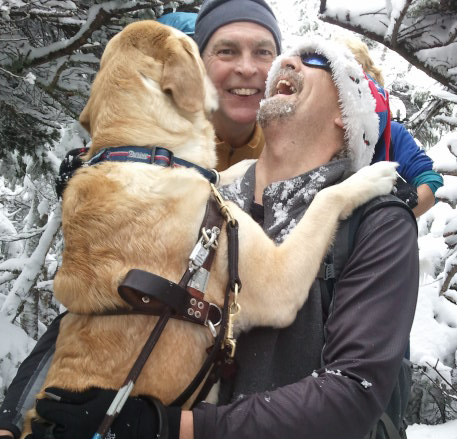 Tags: blind hiker, challenges, Hike Leader, Hiking, Randy, winter. 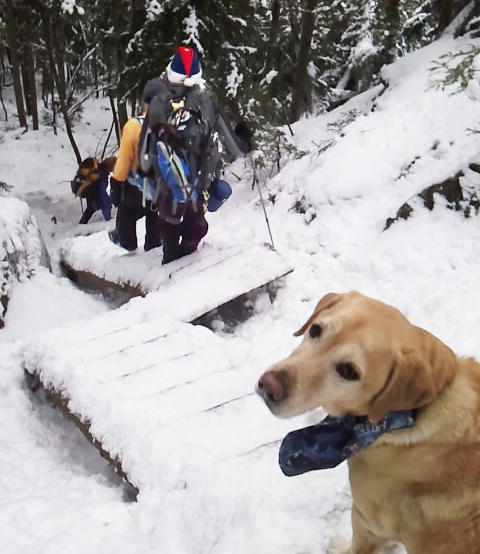 Quinn is a master climber as he leads Randy up a treacherous path. 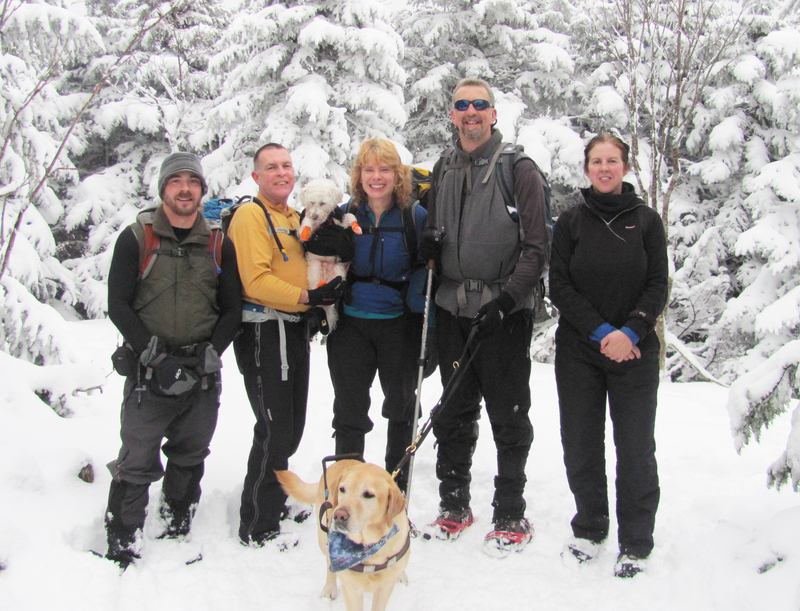 Our winter hikes on the “NH 48” have begun in earnest and have been very successful so far. We have already traversed a number of peaks, with our most impressive achievement this winter to date being our climb of seven summits of over 4000 feet in four days. 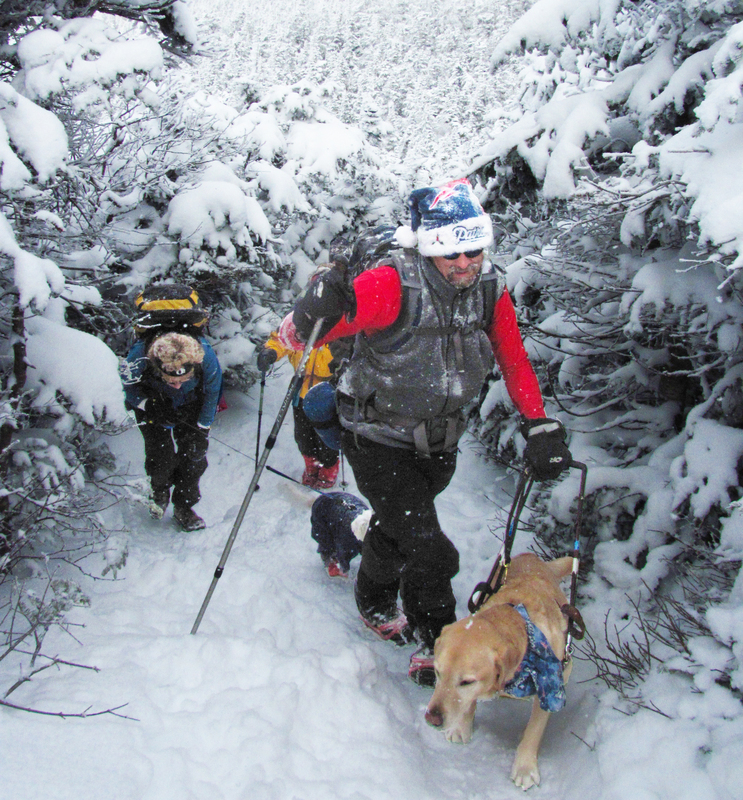 More than 40 miles and over 10,000 feet of elevation gain is simply a respectable challenge for most people; we have accomplished this and significantly more as winter has barely begun to overtake the White Mountains. Our challenges have been significant–the trail-heads are generally bare ground or icy coated rocks, which makes the hikes more difficult. They transition above 2500 feet to several feet of snow with a narrow snow shoe trail broken through where other hikers may have passed. While the snow often makes the going easier, that transition has some steep and slippery points with hidden foot traps throughout. These are not the ideal conditions to make climbing easier for me or my guide dog Quinn. Quinn’s fame is growing both along the network of trails and in the cyberspace network which carries the tale of the tail-wagging wonder who is guiding a totally blind man to the top of peak after peak during the White Mountains winter 2012 season. To be certain, the accolades are well deserved as our speed and efficiency continue to increase and the number of peaks begin to fall beneath our feet. "Has Dad found someone else?" In that four-day span, Garfield, Tom, Field, Willie, Liberty, Flume and Moosilauke were added to Tecumseh, Jackson, Hale, and Cabot on our winter season’s summit success stories. 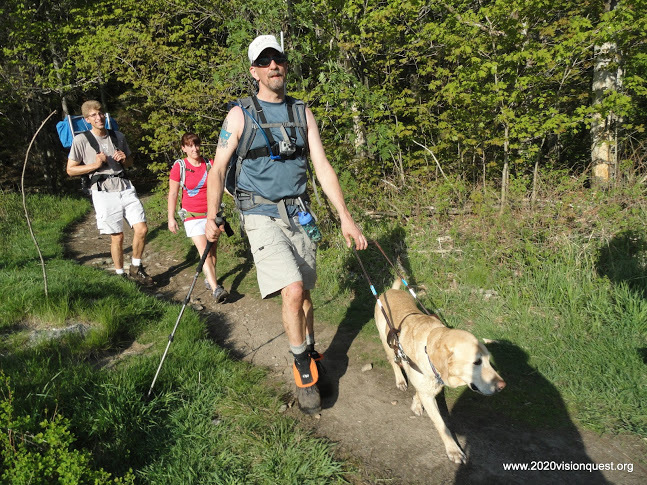 An assortment of different hikers have joined us on the various hikes and we’ve met an significant number of fantastic people upon the trails. Many of those who witness the marvel of Quinn’s work are astounded by the dedication and ability he possesses. What many may not realize is that in our group, there is a battle for top dog. It is not with Dusty, the recent rescue pup of Bob and Geri Hayes, though he is admittedly a little marvel in his own right. His boundless energy in surging ahead on every trail to the extent of his 20-foot leash or his near-constant darting into the side woods to plunge his rodent-sniffing nose after every squirrel scent with rarely a moment delay in our progress. It is in fact Bob Hayes who is battling it out with Quinn for “top dog.” Not only does Bob bring a fair bit of hiking experience and motivation into our undertaking, he also brings a supportive human guide element to particularly tricky areas and many of the descents when we need or want to increase our speed. Randy, Bob, and the Mighty Quinn make the best team! Bob’s and my teamwork has continued to improve our communication and efficiency. Using techniques such as putting my hand upon his pack so I can follow along behind him have helped us traverse vast sections of trail in times better than the AMC book suggests for those regions. We have developed an endurance of work which has far surpassed any prior guiding efforts, and in the case of Mt. Hale actually involved virtually jogging the entire descent of the trail for a summit-to-car travel time of an incredible 2 hours and 15 minutes! Each person accompanying or encountering us for any length of time upon these wilderness excursions will undoubtedly catch a different part of our experience. Many have provided me with encouragement and inspiration in various ways, for which I am incredibly appreciative. As for who will be “top dog”: the simple fact is that both Bob and the mighty Quinn share honors as my guides, both outstanding in their own ways. They have my full gratitude for their willingness to team up with me and make this incredible journey possible. How many thousands of feet of elevation we climb, miles of trail we cover, or simple number of peaks we achieve this winter will be determined as the winter unfolds. I already know full well how much I love the experience and celebrating our joys and accomplishments together!